Across the metropolises of the United States, gentrification is making neighborhoods hardly recognizable. In a short time, what was once a minor force of urban change, gentrification is now sweeping through many cities like a tsunami. By some estimates over the last 15 years, nearly 20 percent of neighborhoods in the 50 largest cities have experienced major gentrification. From New York to Los Angeles, there has been a large influx of middle class families. Some have even begun to do what had long been unthinkable in the post-war decades of white flight from central cities to the suburbs; enroll their children in urban public schools. This process presents a unique opportunity and an enormous challenge. 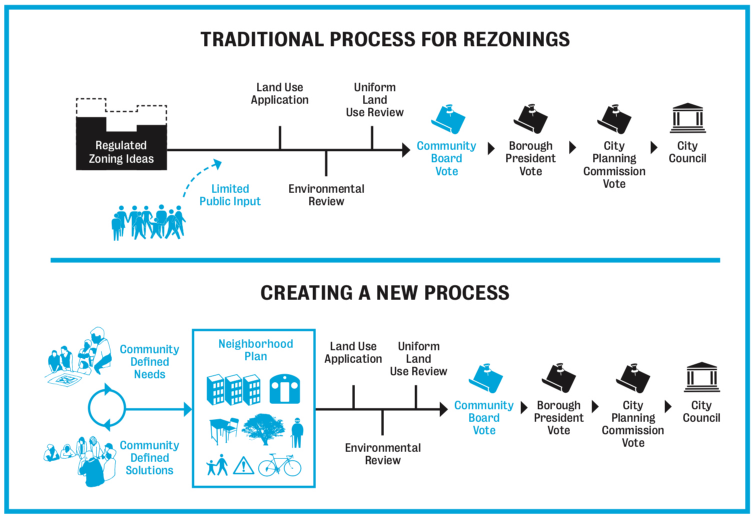 How can our cities and schools welcome gentrification while protecting existing residents? While in many cases throughout the country schools in gentrifying neighborhoods remain segregated by race and class, in Washington DC something different is happening. 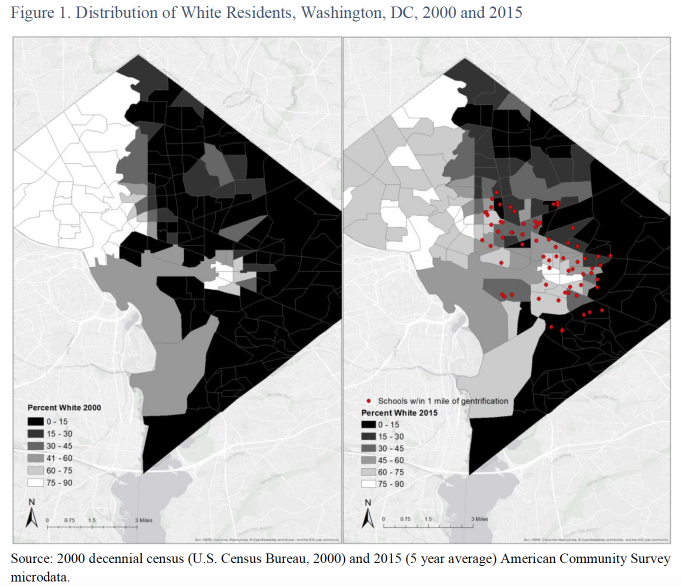 Using data from the National Center for Education Statistics, Common Core of Data, and the Census, our recent study analyzed school enrollment and segregation trends between 2000 and 2015 in Washington DC’s most rapidly gentrifying neighborhoods. We found that during this period, DC’s fastest gentrifying areas saw a tenfold increase in the white population from approximately 5% to almost 50%. In the classroom, white enrollment in the same areas increased from 1% to 8%. This indicates that white families are beginning to embrace their local public schools. It also means that racial segregation in these increasingly diverse neighborhoods is declining. Between 2007 and 2014, the amount of hypersegregated traditional public schools, where 90% or more of students are minorities, fell from 67% to 41%. Charter schools saw a more modest decline, from 77% to 70%. Often, when families of color are replaced by gentrifier families with fewer children and little interest in public schools, overall enrollment declines, in DC we found that not to be true. In fact, DC schools in gentrifying areas saw significant growth, with Black enrollment up 72%, White enrollment, though still small, increased more than tenfold, and the Hispanic enrollment tripled. As this pattern plays out in gentrifying urban communities around Washington and elsewhere, it raises the possibility that long-segregated schools in American’s urban centers could begin a path toward integration. While neighborhood gentrification presents a positive opportunity to integrate previously segregated communities and schools, this could pose a potential risk of displacement to long-time residents, particularly renters. Some cities and school districts, such as Denver, Portland, Raleigh, New York City and Philadelphia, have begun to develop policies to protect existing, vulnerable communities while welcoming the arrival of this new wave of gentrifiers. In one of the nation’s most expensive housing markets, with widespread gentrification and the largest school system in the country, New York City is home to some of the most racially segregated schools. Recently the city has released a plan to make its’ schools more representative of the changing demographics of the city. Their strategies include increasing the number of dual language programs and the creation of magnet schools that offer a wide range of distinctive programs and partnerships to attract students of all backgrounds. In addition, the Department of Education is planning to award magnet grants to schools that are more diverse. Simultaneously, in 2017 the NYC City Council approved the “The East Harlem Neighborhood Plan” to address the affordable housing crisis across the city. The plan is part of a comprehensive, community-focused effort aimed at identifying opportunities for the creation of new mixed-income housing and the preservation of existing affordable units. Another example of a city with rapidly shifting demographics is Denver, Colorado; where the board of education and city officials are setting a good example as they begin to tackle these challenges. 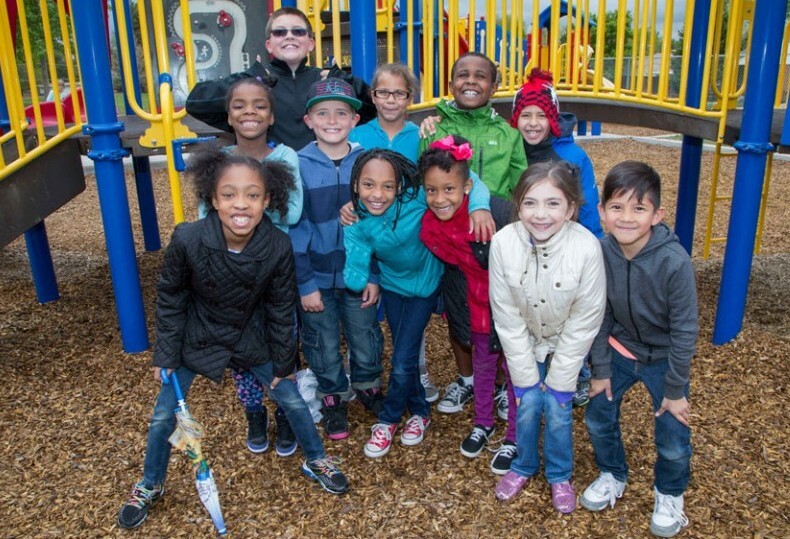 To address declining enrollments and combat school segregation The Denver Board of Education recently established a citywide “Strengthening Neighborhoods Initiative”. This initiative developed recommendations to increase integration across the schools such as quantitative targets for school integration, partnerships with transportation and housing authorities, and community outreach. If school systems can figure out how to create diverse schools amid gentrification, it is possible that historically segregated schools could begin to accrue the benefits associated with desegregation. Desegregated schools are associated with numerous positive outcomes, including academic achievement, enhanced critical thinking and communication, the ability to navigate multiple cultures, and a greater likelihood of living and working in diverse environments later in life. It is likely that the benefits associated with desegregated schools would extend to individuals as well as neighborhoods. If the goal is to create stable and diverse neighborhoods and communities, we will want to encourage middle-class families to invest in urban neighborhoods and the public schools that come with them. Smart policies that link housing and schools are needed to make sure that urban school systems get this rare opportunity right. Although greater housing production and preservation is necessary in neighborhoods struggling to offset the housing market pressures, this alone is not enough. In order for gentrification to be a shared opportunity, efforts at meaningful integration across the lines of class and race are just as important. Schools, as neighborhood anchors, will serve to ultimately integrate these newly multiracial communities. Kfir Mordechay is an Assistant Professor at Pepperdine University and a Researcher at the UCLA Civil Rights Project.